The 28 metre sportfish motor yacht Mustang Sally, jointly listed for sale by Superyacht Sales & Charter and Galati Yacht Sales, has been sold with the buyer introduced by Spencer Markatos at Denison Yachting. Built in GRP by US yard Viking Yachts, she was delivered in 2016 as one of the yard’s Viking 92’ enclosed bridge models. Her neat profile includes dual mezzanine decks, one in the cockpit and the second on the main aft deck. The second mezzanine, off the saloon area, offers both rear facing lounge seating and a table for al fresco dining. Accommodation is for 12 guests in six cabins including a full beam master suite, two doubles to starboard and three twins to port, all with full en suite shower facilities. Crew quarters are aft with access from the cockpit. Her 7.3 metre beam transforms the saloon into a majestic living room with built-in furniture and plush features such as a 60 inch flat screen television that rises on a lift out of the custom cabinetry. To starboard, there is a wet bar and satin finished walnut cabinetry. To port, a large U-shaped sofa provides plenty of space to relax and a dining room table with seating for eight is forward of the sofa. The L-shaped island in the galley complements the working area and all counter tops are in custom granite. The enclosed bridge is accessed off a stairwell in the aft portion of the saloon and practically equates to having a second saloon. Triple Stidd helm seats face the helm station and its impressive electronics while a large L-shaped sofa and reclining chair provide additional space for relaxing and a place to enjoy the ride. 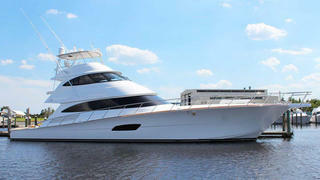 Powered by twin 2,600hp MTU diesel engines, she is fitted with Seakeeper gyroscopic zero speed stabilisers.